"USS LCI-L-713, Sakarissa YTM-269, Alert WSC-127 ... Portland, Oregon"
Seen along the Columbia River, Portland, Oregon. Currently (2016) being restored and housed at Swan Island, Portland, Oregon, next to the PT-658. "The LCI (L) 713 was originally built at the Lawley Shipyards in Neponset, Massachusetts and was commissioned on September 18th, in 1944. After shakedown and training cruises at Solomons, Maryland, she sailed through the Panama Canal to the Pacific Theater of Operations where she earned a battle star while assigned to Flotilla 24. She participated on two combat landings in Mindanao and Borneo before the end of World War II. From then on until December 1945 she transported troops around the Philippines. She arrived back in the United States in January 1946. She was decommissioned on October 6th, 1946 and released to the Maritime Commission for sale. On February 10th, 1948, the ship was purchased at government auction by C. T. Smith & Son and picked up from the Navy in Seattle. After a two day trip to Portland, Oregon, it was found that she would not be practical for towing logs so she was docked and for several years used for stowing gear and fuel for the log-towing company. In the late 1950's the 713 started taking on water and sunk in the Columbia River near the town of Stevenson, Washington.At this point Arthur A. Raz became intrigued with the sunken 713. Finally in February 1976, he raised the ship and towed it to Portland, Oregon. He had originally planned for the ship to be converted into a commercial tug boat but found that the design of the ship was impractical for such purposes. He had discussed the possibility of restoring it. However, due to his untimely death, he was never able see it through. The ship was sold for scrap value in 1998 to a group of individuals who recognized it for its historical value. In order to ensure that the 713 would be protected and preserved for future generations, the AFMM was formed as a non-profit and in 2006 the AFMM purchased the LCI-713. Our dedicated team of volunteers that include electricians, welders, college students, businessmen along with several LCI veterans who share a common interest are bringing the ship back to her original war time condition. They are proud to be involved in the restoration of this ship, making her the last remaining LCI in the original war time configuration." Source: Amphibious Forces Memorial Museum ("amphibiousforces.org") website, 2015. Click image to enlarge USS LCI-L-713, Portland, Oregon. The Thunderbird Hotel in the background. View from Vancouver Landing, Washington. Image taken July 2, 2011. 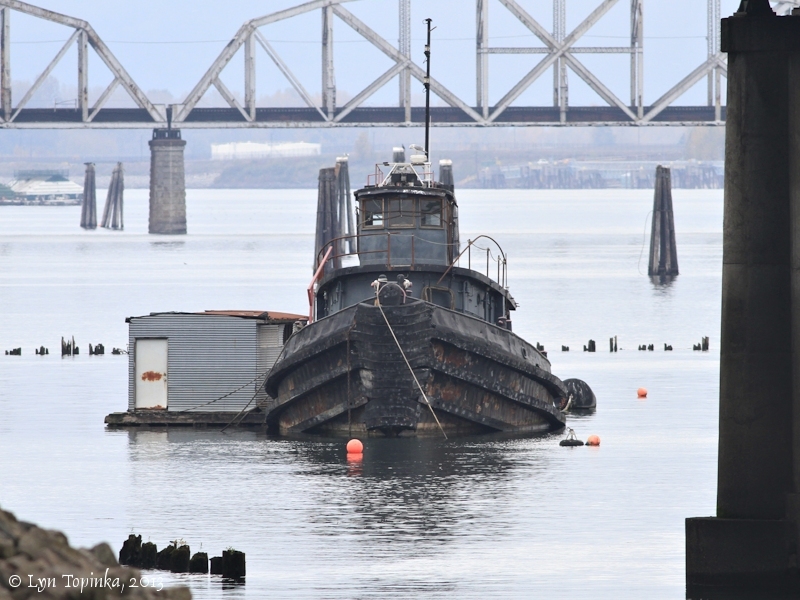 Currently (2018) being restored and housed on the Columbia River, Portland, Oregon. A chief of the Tuscarora tribe during the late 18th and early 19th centuries. Sakarissa (YT-269) was laid down as Port Madison under Maritime Commission contract (MC hull 436) on 13 April 1942 by Birchfield Boiler, Inc., Tacoma, Wash.; launched on 14 July 1942; sponsored by Mrs. William Walker; acquired by the Navy on 12 April 1943 and renamed Sakarissa (YT-269); and placed in service on 26 April 1943. Following her initial training, Sakarissa was assigned to ABSD-1 and began work to prepare that sectional dock for transit from the west coast to the New Hebrides. At the end of August, the sectional dock was ready and Sakarissa departed San Francisco in the force which towed ABSD-1 west. Thirty-four days later, on 2 October, she reached Espiritu Santo and began work to reassemble the ABSD at Pallikulo Bay, between Aessi Island and Espiritu Santo. The job, delayed by accidents, stretched through November. Early in December, the ABSD began docking and repair work. Sakarissa remained assigned to the sectional dock to assist in docking and undocking warships and merchant ships that required her services. In the spring of 1945, the ABSD was ordered further west; and, after being dismantled, departed the New Hebrides in July, accompanied by Sakarissa, now designated YTB-269, and other ships assigned to her. By the end of World War II, services had been resumed at Samar, Philippines. The large number of ships involved in post-war activities and the limited facilities available, kept the force occupied into the spring of 1946 when the number of ships had dwindled and permanent docking facilities had been established. ABSD-1 was ordered decommissioned and inactivated. Sakarissa, with other tugs, was ordered back to the United States. In mid-April, the YTB departed the Philippines. By mid-May, she was in the Marshalls; and, in mid-June, she arrived in Pearl Harbor. Two months later, she resumed her voyage eastward and reached San Francisco on 22 August. Sakarissa, redesignated YTM in 1962, provided harbor tug services to the 12th Naval District until 15 January 1974. At that time, her name was struck from the Navy list, and she was transferred to the Maritime Administration for further service with the Reserve Fleet at Suisun Bay, California." Click image to enlarge Sakarissa YTM-269, Portland, Oregon. The Thunderbird Hotel in the background. View from Vancouver Landing, Washington. Image taken July 2, 2011. Click image to enlarge Sakarissa YTM-269, Portland, Oregon. NOTE: the Thunderbird Hotel is missing the background as it burned to the ground in 2014. View from Vancouver Landing, Washington. Image taken April 30, 2014. Click image to enlarge Sakarissa YTM-269, Portland, Oregon. View as seen from Vancouver Landing. Image taken December 31, 2016. Click image to enlarge Sakarissa YTM-269, Portland, Oregon. Image taken November 8, 2013. According to the "oldcutteralert.com" website (2018), the former U.S. Coast Guard Cutter Alert WSC-127 is the oldest operational Ex-United States Coast Guard Cutter. 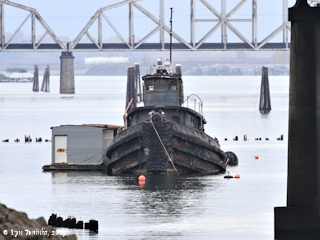 Currently (2018) the Alert WSC-127 is being restored and housed on the Columbia River, Portland, Oregon. "In the 1920's the United States Government was actively involved with the enforcement of Prohibition (The Volstead Act). During that era, the manufacture, sale and consumption of alcoholic beverages was illegal. In an attempt to assist with the capture and arrest of liquor smugglers on the upper east coast of the United States, President Calvin Coolidge ordered the construction of thirty-three new Coast Guard cutters. The mission of enforcing prohibition and seizing illegal liquor was short lived, and in 1928, the Alert navigated the Panama Canal, on her way to the West Coast of the United States, arriving in January of 1929. The Alert was assigned duty in the Bering Sea, conducting search and rescue missions and providing supplies and assistance to native inhabitants of the Ketchikan, Alaska area. The Active Class cutters were 125 feet in length and 23 feet on the beam. Affectionately recalled by Coast Guardsmen as reliable, rugged and rough-riding, these ships were equipped with wooden decks, above and below, constructed with 3" by 3" douglas fir. The Alert was purchased from the Coast Guard in 1969 by Highland Film Labs ... The Alert was then maintained in her original Coast Guard condition, which was essentially unchanged from 1945, and was very active in San Francisco bay maritime activities. The Alert was utilized by the sea scouts for training purposes, and occasionally she made appearances in the news, television shows, and movies. Since 1990, the Alert sat unused and many of her systems became inoperable. In early 2005, the Cutter Alert Preservation Team, Inc., a non-profit corporation, was formed and took over ownership of the Alert, and after eighteen months of overdue maintenance by devoted C.A.P.T. chief engineer Mike Stone, the Alert was once again operable and seaworthy. The Alert celebrated her 80th birthday in 2006 and recent research with the United States Coast Guard Historian's office, and many other sources, confirm that the Alert is the oldest engine powered ex-United States military warship in operating condition in the world. The Alert is also the oldest originally configured ex-United States Coast Guard Cutter afloat. The future for the Alert will consist of museum type tours of the ship and her systems, overnight stays for youth and veterans groups (she has berthing for over thirty-five persons plus three officer's state rooms); and of course remaining operational in order to conduct on the water activities as a good will ambassador of her home port of Portland, Oregon." "The Active-class patrol boat was one of the most useful and long-lasting classes of United States Coast Guard cutters. Of the 35 built in the 1920s, 16 were still in service during the 1960s. The last to be decommissioned from active service was the Morris in 1970; the last in actual service was the Cuyahoga, which sank after an accidental collision in 1978. They were designed for trailing the "mother ships" along the outer line of patrol during Prohibition. They were constructed at a cost of $63,173 each. They gained a reputation for durability that was only enhanced by their re-engining in the late 1930s; their original 6-cylinder diesels were replaced by significantly more powerful 8-cylinder units that used the original engine beds and gave the vessels an additional 3 knots. All served in World War II, but two, the Jackson and Bedloe, were lost in a storm in 1944. Ten were refitted as buoy tenders during the war and reverted to patrol work afterward. Originally designated WPC, for patrol craft, they were re-designated WSC, for sub chaser, in February 1942, during World War II. The "W" appended to the SC (Sub Chaser) designation identified vessels as belonging to the U.S. Coast Guard. Those remaining in service in May 1966 were re-designated as medium endurance cutters, WMEC." 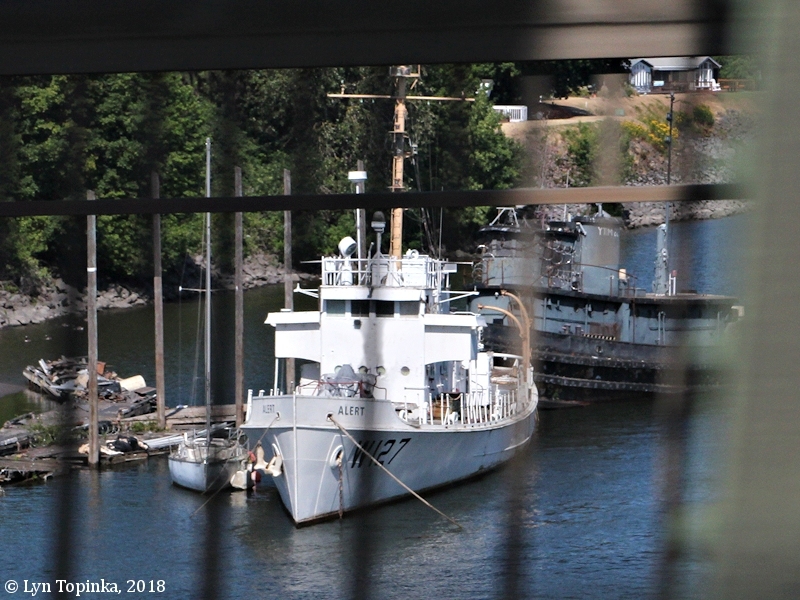 Click image to enlarge Coast Guard Cutter Alert WSC-127, with the Sakarissa YTM-269, Portland, Oregon. View as seen from Vancouver Landing. Image taken December 31, 2016. 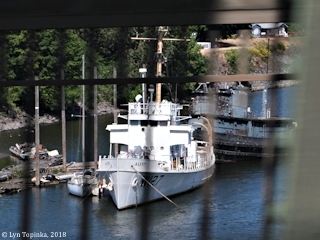 Click image to enlarge Coast Guard Cutter Alert WSC-127, Portland, Oregon. View as seen from Vancouver Landing. Image taken December 31, 2016. Click image to enlarge Coast Guard Cutter Alert WSC-127, with the Sakarissa YTM-269, Portland, Oregon. View as seen from crossing the Interstate 5 Bridge. Image taken July 16, 2018.